Spring is a busy time in Yellowstone National Park. As the winter season draws to a close, roads are opened up, warm-weather accommodations are being prepared for guests, and the finishing touches are being put on the park’s spring adventure and learning packages. Behind the scenes, Yellowstone’s year-round residents are busy, too. During the spring season, many of the animals that live in the park are having their young, which makes springtime prime time for viewing some of Yellowstone’s smallest and friskiest inhabitants. Planning a spring visit to Yellowstone? Here’s the scoop on when you’re most likely to see some baby animals this spring. Black and grizzly bears are actually born during the winter months, snug inside their dens. Mother black bears sleep through most of their labor and only become semiconscious during delivery, when they give birth to one or two cubs. They then fall back asleep for another two months while their blind and toothless cubs nurse and sleep beside them. In spring, baby bears begin emerging from their dens. If you do spot bears in Yellowstone, keep your distance – at least 100 yards is recommended, and mother bears may be especially protective of their young. It doesn’t take long for newborn bison calves to start getting around – in fact, most bison calves can keep up with their mothers as soon as two hours after they’re born. Bison calves have fuzzy, reddish fur, and they’re protected from danger by the rest of the herd, which surrounds the calves to keep them safe. There are an estimated 4,900 bison living in the park, moving from the grasslands in the summer months into hydrothermal areas along the Madison River and land north of the park during the winter. In May, bighorn lambs typically give birth to one lamb. In order to keep their babies safe, they generally stick to areas of high elevation in the park that are not easily accessed by predators. These areas typically tend to produce lots of tasty vegetation to sustain the sheep. There are about 10 to 13 interbreeding bands of bighorn sheep in the park. At most recent count, the park contained a ratio of 38 lambs per 100 ewes, an indicator that the bighorn sheep population is stable and slightly increasing. Within an hour of birth, elk calves start taking their first steps upon spindly long legs. Even though they have very little scent, elk calves are a common target of many of the predatory animals in the park, including bears and mountain lions. To protect their young, elk mothers will run, distracting predators from their small and defenseless calves. A newborn elk calf weighs about 30 pounds; when fully grown, a bull elk weighs around 700 pounds and a cow approximately 500 pounds. Need some help planning your spring adventure in Yellowstone National Park? Check out these spring travel packages for some inspiration. 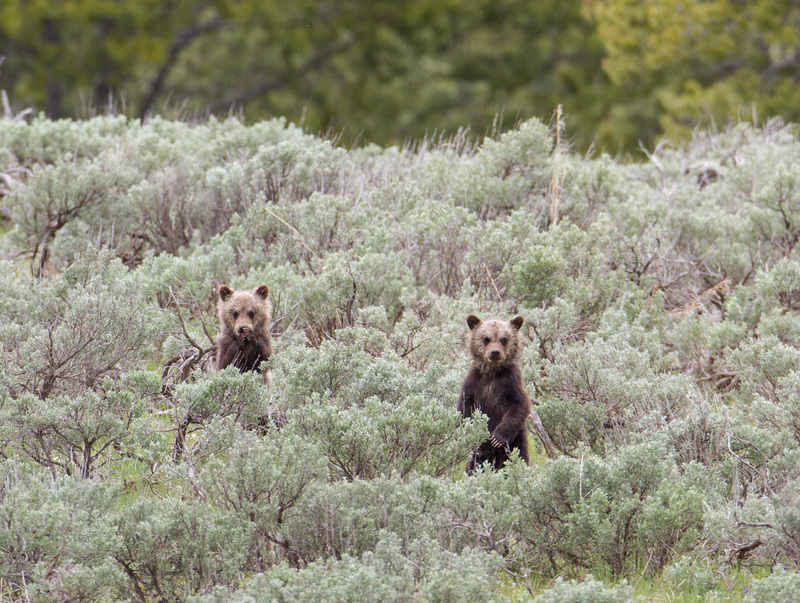 Be sure to pack your binoculars and camera, and get ready to meet Yellowstone’s youngest and cutest inhabitants.